Heat oven to 450°F. Line 15x10x1-inch baking pan with foil. Place lamb chops in foil-lined pan. 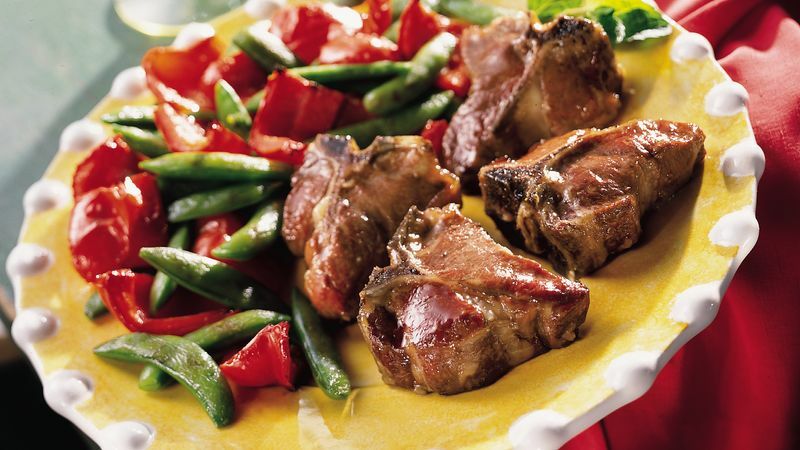 Arrange sugar snap peas and bell pepper around chops. Bake at 450°F. for 10 minutes. Meanwhile, in small saucepan, combine all remaining ingredients. Cook over low heat until jelly is melted, stirring constantly. Remove chops and vegetables from oven; brush both with half of jelly mixture. Return to oven; bake an additional 10 minutes or until chops are of desired doneness and vegetables are tender, brushing with remaining jelly mixture once or twice during baking.